1.1 Cell Introduction Notes A clear, condensed summary of topic 1.1 Cell Introduction, which is the first topic of both HL and SL IB Biology. Sub-topics within this document are: Cell Theory, Functions of Life, Unicellular Organisms, Surface Area:Volume ratio, Magnification, Emergent Properties, Cell Differentiation, Gene Packaging and Stem Cells. 1.2 Cell Structure Summary Mindmap A summary of topic 1.2 Cell Structure in IB Biology (required for both SL and HL). Covering topics such as cell structures, features, and micrographs. IB Biology Topic 4: Ecology Detailed objective-by-objective summary notes for Topic 4: Ecology for IB Biology SL/HL. Contains information on everything you need to know from 4.1 to 4.4, according to each understanding, application or skill. Written by a IB HL Biology student who graduated in with a 45/45. 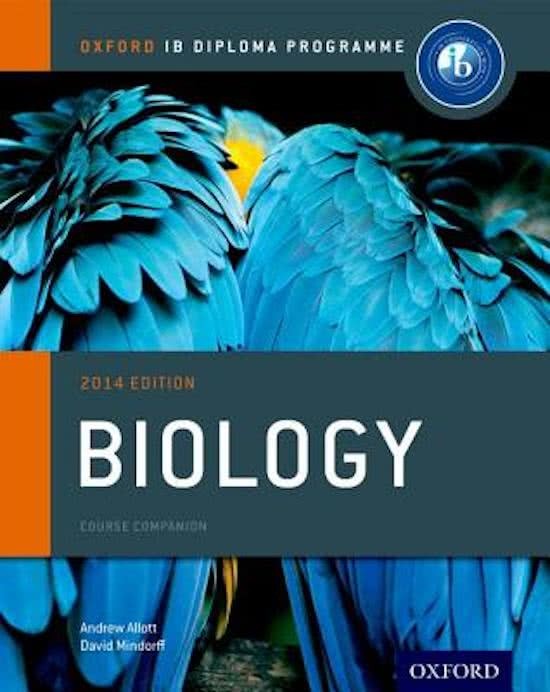 IB Biology Topic 11: Animal Physiology Detailed objective-by-objective summary notes for Topic 11: Animal Physiology for IB Biology HL. Contains information on everything you need to know from 11.1 to 11.4, according to each understanding, application or skill. Written by a IB HL Biology student who graduated in with a 45/45. IB Biology Topic 3: Genetics Detailed objective-by-objective summary notes for Topic 3: Genetics for IB Biology SL/HL. Contains information on everything you need to know from 3.1 to 3.5, according to each understanding, application or skill. Written by a IB HL Biology student who graduated in with a 45/45. 1.1 Cell Introduction Mindmap Summary A mindmap summary of topic 1.1, covering: Differentiation, Stem Cells, Cell Theory, Functions of Life, Unicellular Organisms (Scenedesmus, Paramecium), Surface Area:Volume Ratio, Magnification, Gene Packaging and Emergent Properties. IB Biology Topic 9: Plant Biology Detailed objective-by-objective summary notes for Topic 9: Plant Biology for IB Biology HL. Contains information on everything you need to know from 9.1 to 9.4, according to each understanding, application or skill. Written by a IB HL Biology student who graduated in with a 45/45. IB Biology Topic 10: Genetics and Evolution Detailed objective-by-objective summary notes for Topic 10: Genetics and Evolution for IB Biology HL. Contains information on everything you need to know from 10.1 to 10.3, according to each understanding, application or skill. Written by a IB HL Biology student who graduated in with a 45/45. 3.4 Inheritance Notes Super lengthy class and book notes for IB BIO 3.4 INHERITANCE, one of the hardest chapters. I left it free because one thing on it is kind of incomplete but it's pretty self explanatory. Stem cells These notes address the challenging content that focuses on enduring, conceptual understanding of biological processes. Introduction to cells These notes address the challenging content that focuses on enduring, conceptual understanding of biological processes. HL 11.4 Sexual Reproduction These are notes for IB Biology HL, chapter 11.4 on Sexual Reproduction. They are extremely thorough and a shorter, condensed version of the Oxford book, as well as has other important information. Phospholipid Bilayer These notes address the challenging content that focuses on enduring, conceptual understanding of biological processes. Eukaryotic cells features These notes address the challenging content that focuses on enduring, conceptual understanding of biological processes. Blood system notes In depth class/lecture notes of IB BIOLOGY 6.2 THE BLOOD SYSTEM. Sur cette page, tu trouveras des résumés, des guides de révision et bien plus de livres de révision IB Biology Course Book, écrits par Andrew Allott & David Mindorff. Les résumés sont écrits par les étudiants eux- mêmes, ce qui te donne les meilleurs renseignements sur ce qui est important de réviser dans ce livre. Les sujets tels que Biology, IB, IB Biology, International Baccalaureate, HL, SL, cells & biology seront traités.